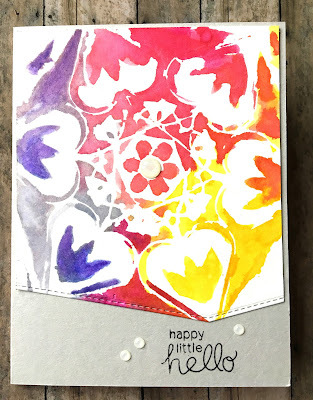 I couldn't resist making this one because I'm just having such fun playing with these bright colors from the Newton's Nook Designs Inky Paws Color Challenge #44. To create this card I used a stencil that I found in my drawer. I painted a panel of watercolor paper with water and then painted the distress reinkers over the wet paper. Once dry, I used a stitched edge die to cut it at an angle and then fit it to a gray card base. I stamped the sentiment from Newton's Hedgehog Hollow stamp set and then adhered a few clear enamel dots. I have to admit this one looks very cool in real life. Wow! This looks spectacular! Thanks so much for sharing at Inky Paws Challenge! Another gorgeous card with a gorgeous background panel! Wow! You're inspiring me to make up some backgrounds for cards like this! Thanks for sharing again in our Inky Paws Challenge!